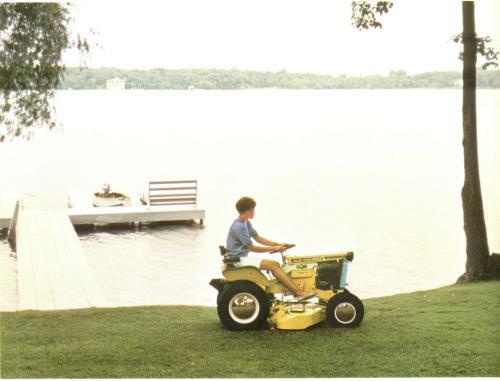 You won't have to worry about "scalping" the high spots when you're mowing uneven ground with a "Bee". As the tractor moves over rough ground, the front wheels guide the center-mounted rotary mower over all the contours. Whatever the terrain, you're assured of a smooth, good-looking lawn with the exclusive "no scalp" mounted mower on a "Bee". This mower cuts to within 5/8" of obstructions on either side to eliminate much hand trimming. It also adjusts easily to exact cutting height. Note that the housing on the "Bee" mower is 6 inches deep. This means you can cut through the heaviest growth without plugging. Some other tractor mowers have housings that are only 2 inches deep.